234 Seiten, 47 Abb., 8 Tab. Risk Management today has moved from being the topic of top level conferences and media discussions to being a permanent issue in the board and top management agenda. Several new directives and regulations in Switzerland, Germany and EU make it obligatory for the firms to have a risk management strategy and transparently disclose the risk management process to their stakeholders. Shareholders, insurance providers, banks, media, analysts, employees, suppliers and other stakeholders expect the board members to be pro-active in knowing the critical risks facing their organization and provide them with a reasonable assurance vis-à-vis the management of those risks. In this environment however, the lack of standards and training opportunities makes this task difficult for board members. This book with the help of real life examples, analysis of drivers, interpretation of the Swiss legal requirements, and information based on international benchmarks tries to reach out to the forward looking leaders of today's businesses. 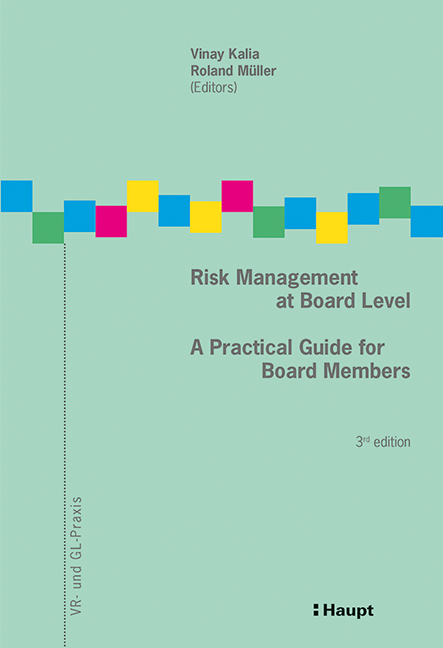 The authors have collectively brought their years of scientific and practical experience in risk management, Swiss law and board memberships together to provide the board members practical solutions in risk management. The desire is that this book will clear the fear regarding risk management from the minds of the company leadership and help them in making risk savvy decisions in quest to achieve their strategic objectives.